Docmosis believes in writing code that tells where each text or data field should be placed while with Windward you use Microsoft Word to design your template, with no programming whatsoever. If you like the idea of having to program every inch of your document, then Docmosis is the one for you. On the other hand, if you want to save time and resources creating documents, then Windward has all the right tools to help you with that task. If you’re working with document generation, be aware of the plentitude of options out there. The Windward Solution and Docmosis are two of the most popular choices. Windward’s product team has created this comparison to help you understand the merits of both. Throughout its decade of product development, Docmosis has held two things constant: it surrounds the user with absurd amounts of syntax and when the user gets stuck, provides almost no support. The amount of syntax for such a simple task is uncanny and failing to type the syntax correctly leads to an error in the document generation. While Docmosis does have unique features, like a Cloud option, it fails to capitalize on them with its poor support systems. When a user runs into an error, Docmosis’ FAQ is largely incapable of helping the user and finding help online is nearly impossible since it lacks internet presence. Sure, you can decide to opt for Docmosis and spend absurd amounts of time typing and fixing simple syntax errors and waiting for support, but we all know how that ends: in frustration. Windward simplifies this process by providing the user with Windward Designer and a much more reliable support system. With the help of Windward Designer, table and chart creation is quick and to the point, taking advantage of Microsoft Office and building upon it. Syntax errors become a thing of the past with Windward Designer doing the heavy lifting. The table below provides an overview of Docmosis and Windward, and its selection of key features. Creating tags in Docmosis is tedious and error prone. The lack of wizards makes tag creation limited, and I found myself constantly looking through documentation and tutorials for creating a simple table. With the extremely limited toolset that Docmosis provides, the user is left fixing simple syntax mistakes constantly and hoping for more functionality. Windward Designer, on the other hand, is quick and easy. 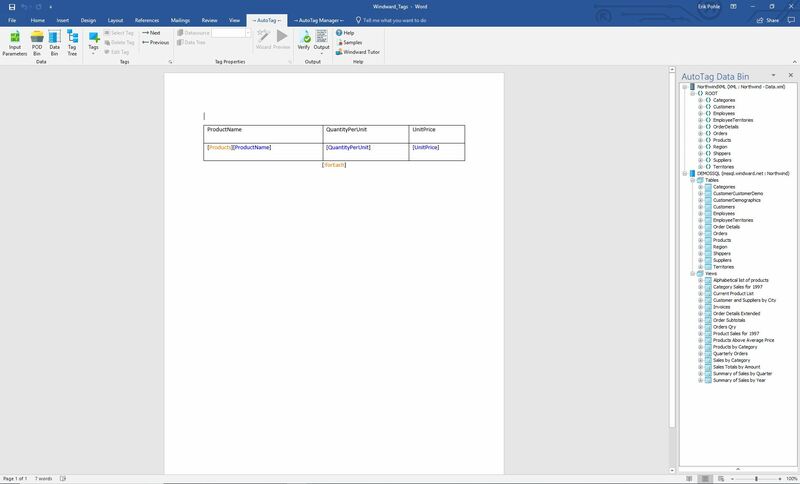 By simply going to the Windward Artist tab in the Microsoft Office Ribbon, the user can select from a plentitude of tag options and edit the tag properties through simple steps thanks to the Tag Editing Wizard. Once a tag has been created, Windward provides the option to save the tag within a POD, allowing for the tag and its properties to be reused in a simple and efficient manner. 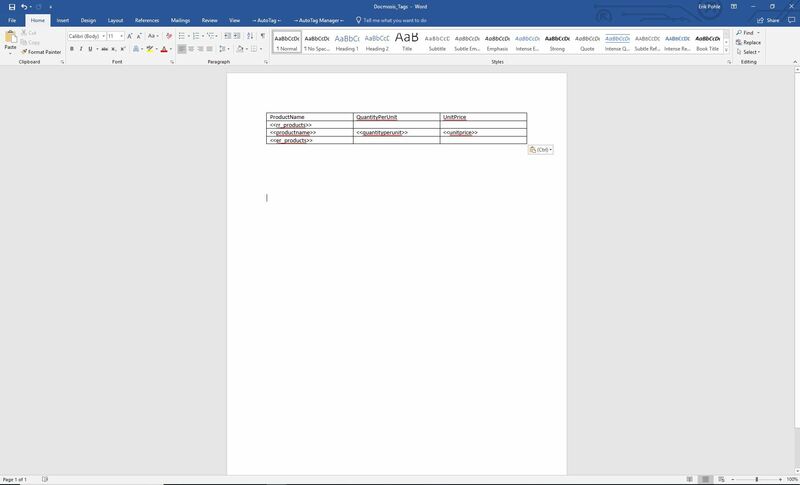 With these advanced reporting tools, creating a complex document is a breeze. Adding tags in Docmosis (Top) is annoying andfilled with unnecessary syntax while in Windward Designer (Bottom), you just open the DataBin in the AutoTag tab and drag and drop the data you want! Simple tables, inability for charts, absurd amounts of syntax for tags, font changing takes time, hard to design template with margins, tables, text boxes, etc. Lack of wizards. Must add specific syntax to document for the engine to know what to generate. Some programming in Java, C#, .NET, etc. Must remember every detail of syntax for document generation to work correctly. Lacks a more thorough FAQ section. Little to no internet presence, support is lacking and takes a while to contact. Windward offers convenience and a host of ease-of-use features unavailable to Docmosis users.